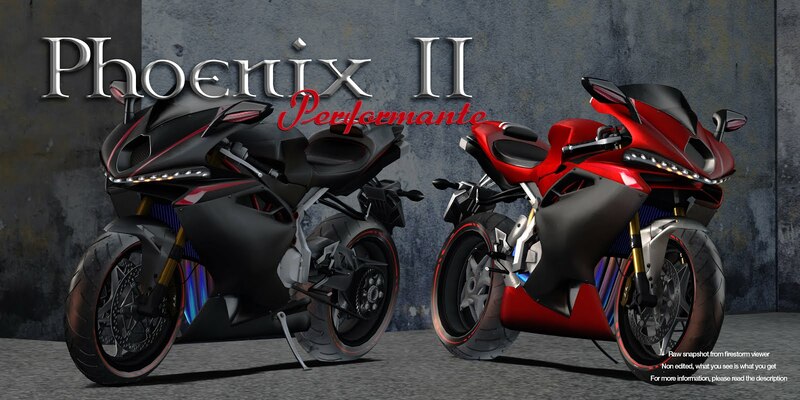 [sau]Phoenix II[Performante] is a Full version, flagship grade product debut in Mancave Apr 2019 with special discounts. If you are new to [sau]motorcycles or sport bikes in second life, This is a no-brainer for your biker life. -The reborn phoenix! 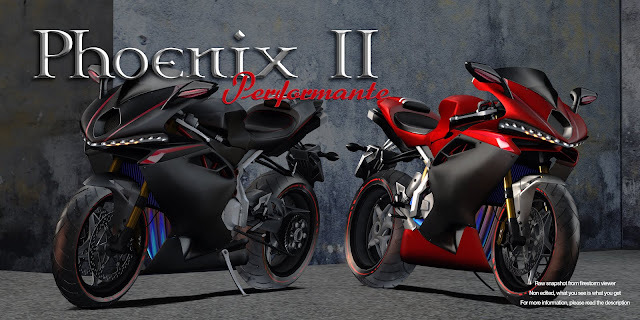 [sau]Phoenix II[Performante] is a reborn from [sau]Phoenix which released in 2013, with everything new and refreshed. The performante package provides absolutely most smoothy and precisely handling in grid. -10 Patterned Paint jobs ! All in One! -Custom paint job template available. -Full seamless custom made animation sets. -2 custom made sound sets. -Resizable and all animation positions are adjustable. -Bonus items: Garage kit vol.1, Short Combat boots, Pickup truck. The [sau] Guarantee: No illegal model used.You get 100% legal,original stuff !